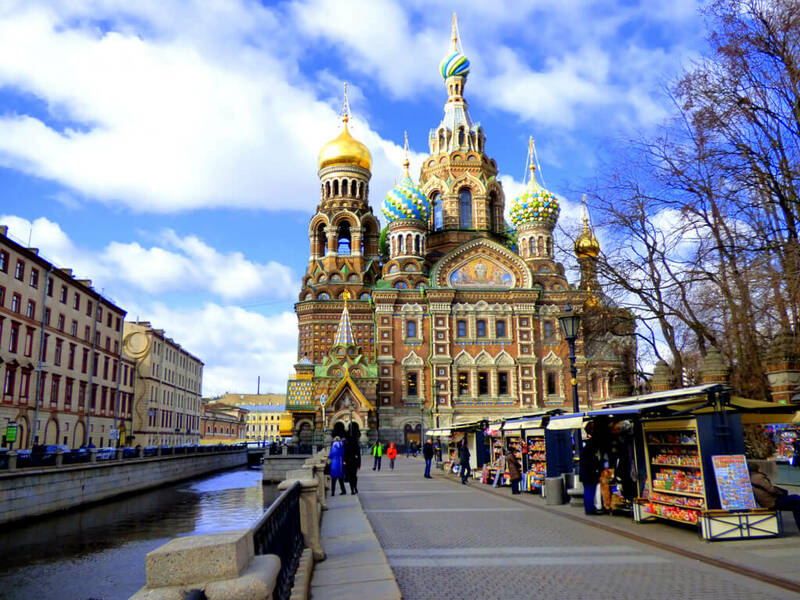 Wondering how to spend 3 days in St. Petersburg, Russia? Here is my recommended 3 day itinerary! St. Petersburg is Russia’s second-largest city and is located by the Baltic Sea. I took a ferry to St. Petersburg from Helsinki as part of St. Peter Line’s visa-free program which allowed me to spend 2 nights and 3 days there. St. Nicholas Naval Cathedral is a baroque style Orthodox Cathedral. I love its pale blue colour! This colourful church was the sight I was most looking forward to seeing in St. Petersburg! Its interior is also very impressive. These two Egyptian sphinxes are over 3500 years old. They were brought from Egypt to Russia in 1832. You can find them by the river in front of the Imperial Academy of Arts. St. Isaac’s Cathedral is the fourth largest cathedral in the world. It took 40 years to build and has a prominent golden dome. However, during World War II, the dome was temporarily painted over to avoid attracting the attention of enemy aircraft. The Hermitage Museum is one of the largest and oldest museums in the world. It houses an extensive collection of art and antiquities. Plan to spend at least several hours here and buy your tickets online in advance to avoid long lineups. There are more than 70 cats who live in the museum (mostly in the basement) and they have special caretakers. During the summer, the cats like to roam outside in the square. The Winter Palace used to be the former residence of the Russian royal family. Now it houses the Hermitage Museum. The Peacock Clock features three mechanical birds. Every hour, the three birds would move and play a song. However, due to its age, the clock only plays the song on certain days. In the morning, visit Peterhof Palace, which is famous for its many fountains and beautiful gold statues. You can get there by train from Baltisky railway station or by taking the metro and then a bus. You can also take a boat (called a hydrofoil) from behind the Hermitage museum on the Neva River. However, this is the most expensive option. Plan to spend a few hours at Peterhof wandering through the gardens and enjoying the fountains. Summer is the best time to visit as all the fountains will be turned on. When I visited in April, only a few fountains were on. Later, I recommend going to a ballet or an opera at the Mariinsky Theatre or the Mikhailovsky Theatre. The Mikhailovsky Theatre is located very close to the Church of the Saviour on Spilled Blood. My friend and I bought tickets for the opera Manon Lescaut in the afternoon (for balcony seats in the back) and went to see it that night. I enjoyed the opera even though I couldn’t understand anything (it was performed in Italian with Russian subtitles shown on a screen). People usually dress up to go the opera, but unfortunately, I hadn’t packed any fancy clothes. No one gave me any weird looks though. I rented opera glasses because my seat was far away from the stage. During the intermission period, you can head downstairs to buy desserts or drinks. I tried a mousse and it was delicious! Russia is famous for its Faberge Eggs, which are jeweled eggs that contain a little surprise (like a miniature carriage or chicken). The Russian royal family used to give each other Faberge Eggs as Easter gifts. The museum has a collection of Imperial Faberge Eggs made especially for the last two Tsars as well as collections of paintings and jewelry. You can buy your tickets online. You can take a guided tour of the museum or rent an audio guide. We took a guided tour. The guide told us lots of interesting facts and spoke perfect English. If you are interested in buying a Faberge egg for yourself or as a gift, the museum gift shop has some very nice eggs. You can spend the next couple of hours strolling along Nevsky Prospekt, the busiest street in St. Petersburg. Now would be a good time to visit some gift shops – I recommend buying a Matryoshka doll, which is a wooden doll filled with matching wooden dolls of decreasing size. Like Faberge Eggs, it is a popular souvenir from Russia. If you enjoyed this guide to St. Petersburg, pin it! Russia is a very interesting country! 😉 I hope you get to visit soon! I’d love to go to Russia one day! Right now it is at the top of my travel bucket list. I’ll definitely saw this for when I head to Russia. I’m sure you will love Russia! 🙂 I really want to visit again someday. It’s definitely one of the most beautiful cities in Europe! And yes, the Hermitage is huge! Planning to take the same trip this summer, great to read someone else’s experience and how you timed the visits to the various places of interest whithin the time allowed visa-free. I also want to go see the opera, hope to manage to do evverything! Russia looks absolutely stunning! This looks like an amazing itinerary. I’ve been wanting to go to Russia so I will definitely reference this when I go!! Thanks Alice, I’m glad you like my itinerary! These places are so beautiful! Those cathedrals look like doll houses. The winter palace….wow such opulence and history. This is definitely on my list. I’ve always wanted to go to Russia. It looks like such a beautiful and fascinating place. I’m glad you had a wonderful time, and these photos are gorgeous! It’s one of my favourite places that I’ve visited. Thanks for complimenting my photos! Russia is definitely one of my favorite locations. I spent a month there in winter and it was gorgeous. Somehow I got to St. Petersburg when there was all slush. It didn’t take away the beauty from the scene though. I would love to visit St. Petersburg during the winter! I think the buildings would look so romantic and charming covered in snow. That’s exactly how I felt when I was there! The architecture was amazing. Loved your itinerary! The pics are stunning especially the ones inside the palace, also I loved the egg meuseum! Seems you enjoyed a lot, keep exploring and sharing ur fun itineraries ???????? I love how colorful St. Petersburg is! I’ve always wanted to go to Russia as I had a thing with studying the Romanov history when I was younger (which was 100% inspired by watching Anastasia :p). This really is the perfect itinerary! I would love to go to Russia! And as I live in Norway it’s our neighbor too. Your blog post and awesome photos really inspired me! Wow!!!! All those colors and the gold – so opulent. Looks amazing. Yes, the golden statues are really impressive! Great photos – St. Petersburg looks stunning. Those gold, intricate interiors really are something! I actually want to go there after reading this! Wow – what incredible architecture and art! St Petersburg looks amazing. I would love to visit here, it’s such an iconic city. Your photos really show it off well and make me want to visit! The architecture there is very special. 🙂 I hope you get to visit soon. I’m going to Sweden in a few weeks, and I still don’t have time to get to Russia, but I will,one of these days, I will! p.s. I like your photographs. Thank you, Victoria! I’m glad you like my photos. Have a nice time in Sweden! The St. Nicholas Naval Cathedral is an absolute stunner, there’s an Orthodox church similar to this in Kiev, but I think the St. Nicholas Naval Cathedral is more beautiful. The Church of the Savior on Spilled Blood is stunning as well, I must visit St Peterburg! Wow St. Petersburg is so colourful! I would love to visit sometime soon! I love your post- what area do you suggest to stay in? I want to be centrally located.